The Centre for Entrepreneurship and Innovation was established by ESAMI in collaboration with LUSEM and officially launched at ESAMI headquarters in Arusha, Tanzania on 26th November 2011 for purposes of supporting the economic development and the fight against poverty in Africa through innovation and entrepreneurship development. It is in recognition of the important role played by business enterprises in both social and economic stability and growth through employment creation, trade and supply of essential goods and services that the centre was established. The centre is domiciled at ESAMI and hosts a venture laboratory for developing entrepreneurs and innovators in Africa. It is also an incubation centre for businesses resulting from student research case studies and projects developed under expert supervision and guidance. b.It is specifically aimed at helping to increase knowledge and skills in new venture creation and business management. The Centre is intended to serve the whole of the African region targeting budding and aspiring entrepreneurs. It also targets well established businesses. These will provide the support structure for the nascent businesses and entrepreneurs in terms of financing, attachment/mentoring, source of raw materials/market for products produced, source of new technology, etc. It will also offer business people a forum to float and test new ideas for business and product innovations. ESAMI is an Inter-Governmental regional management development organization established in 1980 and currently owned by ten African member states. These include Kenya, Malawi, Mozambique, Namibia, Seychelles, Tanzania, Zambia and Zimbabwe. It was established in 1980 to service the eastern and southern African countries. In 1997, through a resolution of the Council of Ministers, the United Nations Economic Commission for Africa (UNECA) designated ESAMI as a centre of Excellence for Management Development in Africa. This effectively transformed ESAMI into the African Management Institute with a coverage of the whole of Africa. ESAMI is headquartered in Arusha, Tanzania and in keeping with international conventions has a headquarter agreement with the government of the United Republic of Tanzania. It enjoys diplomatic cover in Tanzania and in all other member states. ESAMI has a tripartite mandate: Management Consultancy; Management Training and Education; and Applied Management Research. 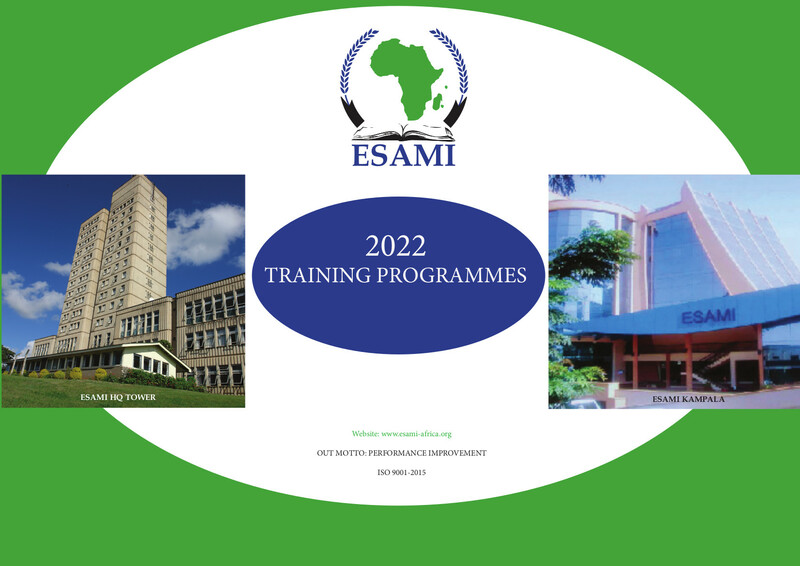 ESAMI is well known in Africa and beyond for its quality management training and education; consultancy and advisory services; research and promotion of successful management and leadership practices. ESAMI offers in addition to its range of short term management training executive master programmes which have developed a lot of interest and demand on the continent and beyond. Some of the on-going masters programmes are MBA, MBA (Transport Economics and Logistics Management); and MBA (Customs Administration and Management). ESAMI also hosts the Trade Policy Training Centre in Africa (trapca), a project jointly implemented by ESAMI and Lund University of Sweden under Sida support. Lund University was established in 1666 and is one of the largest, oldest and broadest universities in Scandinavia which has consistently been ranked among the world’s top universities. It is the leading research university in Sweden in terms of research grants. With eight faculties, Lund University activities cover education and research in engineering; science; economics and management; medicine; humanities; theology; fine arts; music and drama. Lund University School of Economics and Management (LUSEM) is one of the eight faculties under which entrepreneurship and management training and education falls. LUSEM is an EQUIS accredited member of EFMD. Lund University is a member of the prestigious research university networks Universitas 21 and the League of European Research Universities (LERU). Lund University has a long tradition of innovation which started almost a hundred years ago. It has a successful entrepreneurship centre that provides a combination of academic and applied entrepreneurial programs including a unique Venture Lab that has developed many entrepreneurs. Some of the projects started in these venture labs have developed into major business companies. It is specifically aimed at helping to increase knowledge and skills in new venture creation and business management.